Miku is my favorite Japanese restaurant in Vancouver. It’s the only North American restaurant of the Tora Corporation. Founded by Seigo Nakamura, Tora operates seven successful restaurants in Japan and has built an incredible reputation for fine Japanese food. Plans are in the works to open restaurants in New York and Los Angeles, but for now, the only way to experience Miku’s famous Aburi-style sushi in North America is to come to Vancouver. Mr. Nakamura spared no expense to create the Vancouver Miku. He even flew in his own chefs and head servers from Japan. In true Japanese fashion, Miku greets all their diners with a loud chant. It can be quite shocking for first timers because it seems like all the chefs are yelling at you. They do the same when you leave. Sally really enjoyed it because she can speak Japanese and was able to respond to their greetings. During lunch time, Miku is very loud. Because of the busy lunch time crowd going in and out, the chanting never lets up. It gives the restaurant a great energy but can bothersome if you’re trying to conduct a business meeting. 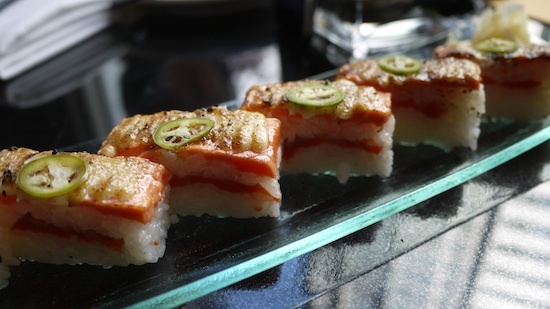 Luckily, we were there to take it all in and dine on their delicious Aburi sushi. 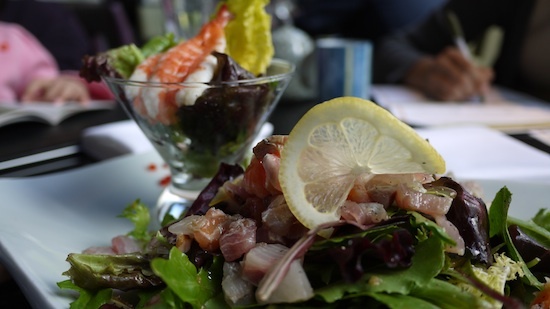 When most people think of sushi, they think of raw fish on rice. 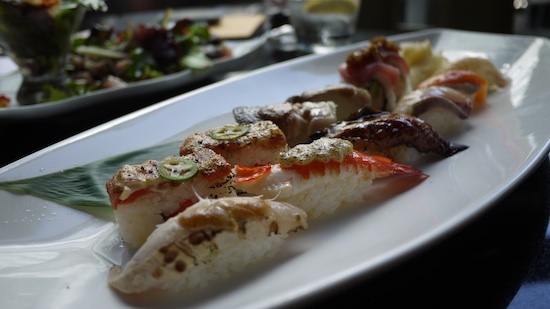 Aburi-style sushi, however, is lightly seared with a touch to give it a nice smoke taste. Then the sushi is topped with some other ingredients and paired with a French sauce. This really adds a new dimension to just plain sushi. 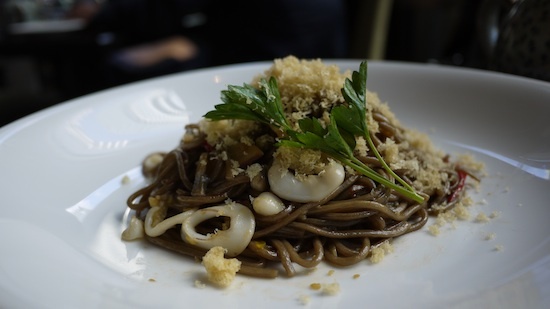 Located inside the Guinness Tower at 1055 West Hastings Street, Miku is at the heart of the downtown financial district and caters to a high-end clientele. Lunch for me, Sally and Sarah came to $85 with tax and tips. Dinner would cost more but it would also be a quieter dining experience since there won’t be as many hurried executives going in and out.